Our Wirtgen miller has a four foot wide drum that is able to mill a variety of depths and make use of a conveyor belt attachment to aid in disposing of millings. Our dump trucks are always well maintained and brightly painted, creating a pleasing and professional job site for you and your customers. Every milling job includes our Wirtgen 120 cold milling machine, an operator and a man on the ground operating the water truck and guiding our milling operator. The company is presently run by the next generation of Baileys. We have always respected and nurtured the strong work ethic that our founder, Boots Bailey, infused in our organization. Following the footsteps of our founder, we have stuck to the philosophy of concentrating on local business. We have always strived to provide the best services of the highest quality in asphalt paving to our clients, and have worked on both residential and commercial projects with the same kind of professional competence. 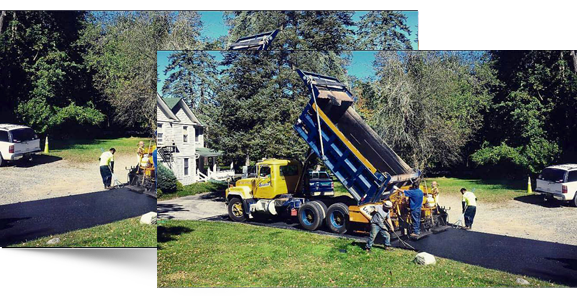 We have always aspired to provide the best quality of services to our clients in anything related to asphalt paving. For us, quality is non-negotiable and is built into the system in such a way that it has become an integral part of our activities. Quality is ingrained in everything that we do. This has contributed to our rise and recognition as one of the leading companies of the region that specializes in all paving work related to roadways, parking lots, and driveways. We take pride in our long list of satisfied clients, who have complete faith and confidence in the quality that we deliver. 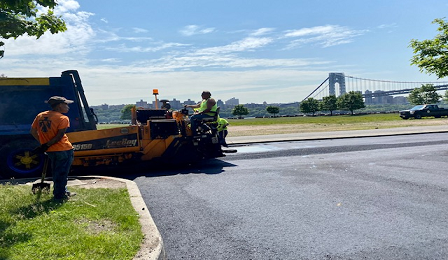 We have a strong team of professionals comprised of civil engineers, supervisors and laborers who are highly knowledgeable and experienced in asphalt paving. We love to take on new challenges and come up with unique and cost effective solutions for our clients. Our penchant for innovation has set new standards in the industry that others would like to emulate. When it comes to asphalt paving or its maintenance and repair, clients do not think twice about approaching us for the most viable solutions that assure the best return on investment. Our professionals are trained to provide the best customer experience that we have been delivering with unfailing confidence for 50 years. How Can I Keep My Parking Lot Free of Snow? Winter storms can keep business owners awake at night worrying how their employees and customers will safely get to their location in the morning. Let Haskell Paving shoulder this burden. Our supervisors monitor storms around the clock during the winter and mobilize our team quickly and as frequently as needed. We handle snow plowing, removal of stockpiled snow, ice removal and sidewalk clearing to reduce accidents and injury in your parking lot. 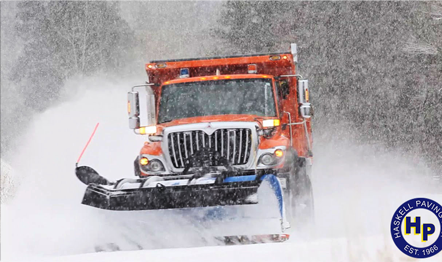 Our supervisors will meet with you to determine the most effective and cost efficient snow removal plan. Once a contract is established, you can check snow removal worries off your list. We will manage the storms for the rest of the season! When Should You Repave Your Driveway? Homeowners must monitor their driveway to ensure normal wear and tear doesn’t get out of hand. With regular seal coating maintenance, a driveway can last up to 20 years. However, this depends on the amount of rain, sun, temperature change, and use your driveway sees. A driveway that has buckling, deep cracks, or significant crumbling on the edges should be repaved. If we pave your driveway, you can let us remember to schedule your seal coating maintenance. We will mail you a reminder to seal coat your driveway one year after it is paved. If you are unsure of the state of your driveway, just give us a call. We will send out an estimator to assess it and recommend the appropriate plan of action. We recommend sealcoating your driveway one year after paving and then every two years after that. This will maintain a beautiful dark, smooth layer that allows for easier snow shoveling and sweeping, as well as enhancing the curb appeal of your home. Sealcoating and crack filling also help maintain the structural integrity of your driveway. It reduces the effect of water, the UV rays of the sun, and erosion which are the most common causes of cracks in your driveway. Sealcoating is best done during the Spring, Summer, and early Fall. It must be completed before the leaves start falling. A freshly sealcoated driveway should not be driven on for 18-36 hours. Asphalt milling is the process of removing existing asphalt from a parking lot or road. This is sometimes called profiling or cold planing. Milling is done using a cold milling machine. The machine uses a large rotating drum covered in metal teeth to remove and grind the road or parking lot surface. This drum also funnels the asphalt towards the center of the machine to be picked up by the conveyor belt and carried into the waiting dump truck for transportation to the recycling center. The depth of milling varies. This depends on the extent of damage to the existing asphalt and the plan to replace the asphalt. The depth of milling is computer automated, but a skilled milling operator is required to run the machine, assess the area, and coordinate with the dump truck drivers for removal. Once the existing asphalt parking lot of road has been milled and power swept, it is ready to receive fresh asphalt. With proper installation, an asphalt blacktop driveway can last you for at least 20-30 years with regular maintenance. Haskell Paving can show you examples of stellar homes with blacktop driveways that have stood proudly for the last three decades in Northern New Jersey (NJ), Bergen County New Jersey (NJ), Westchester County New York (NY), Rockland County New York (NY), Orange County New York (NY), and Fairfield County Connecticut (CT). In addition to new driveway construction, Haskell Paving excels at resurfacing, repairing, or sealcoating existing driveways. We are able to assess your driveway and help you determine the most appropriate solution to your problem. 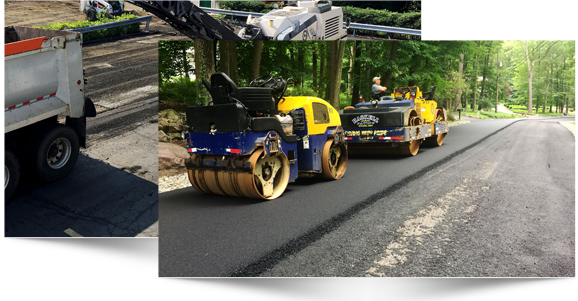 Haskell Paving offers you over 50 years of experience in roadway and parking lot new construction paving and asphalt resurfacing. From minor restoration jobs to major new construction, we have resources to cover it all. Unlike other commercial paving companies, we believe in isolating the root causes of your problem before tackling them with the latest technology. 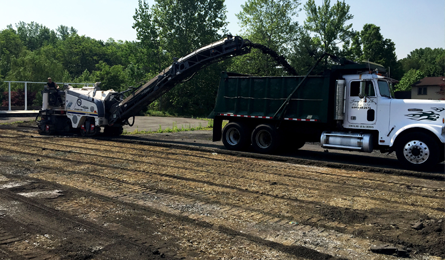 We have the capability to guide you through each and every step of laying down a new roadway or parking lot or renovating your existing asphalt pavement. Haskell Paving, Inc. was founded by Robert “Boots” Bailey in 1966 with the intention of serving the region of Northern New Jersey (NJ). It has still remained a closely held family owned business, and is recognized as a prominent milling and paving company located in Passaic County in New Jersey. Over the past five decades, we have proved our professional competency as a reliable paving contractor to numerous satisfied customers. This has encouraged us to spread the network of services to regions beyond Northern New Jersey. We now also serve Westchester county, Rockland county and Orange county of New York and Fairfield County of Connecticut. We are much more than a milling company. We are a full service asphalt pavement company that undertakes all kinds of asphalt projects for upkeep of existing roadways and driveways as well as construction of new ones. We undertake complete responsibility of delivering the best in class services that assure clients get much more than what they expect from us. Surpassing client expectations has been a way of life for us, and we do it diligently for all sizes of projects with the same alacrity and professionalism. Regardless of the size of the project and its value, we attach the same kind of importance to all our clients who deserve nothing less than the best from us. As a leading asphalt paving contractor, we have a strong portfolio of projects that we have handled. We are well aware of our strengths, and we have taken ample measures to build our reputation around it. We have managed and executed projects related to commercial parking lot preparation North New Jersey, as well as road construction North New Jersey. From asphalt removal, resurfacing, and installation to concrete sidewalks and curbs, we have done it all for our clients. We take pride in our work and ability to handle any kind and size of asphalt paving construction project, and that has given us the identity of being a leader in the industry today. We have also handled several government projects that have been executed in the areas of our operations. We invest in specialized equipment and train our professionals regularly so that they are updated in terms of technology and advanced techniques. This gives us the advantage of following the best practices of the industry. It is our endeavor to continually improve our standards and beat our competition.